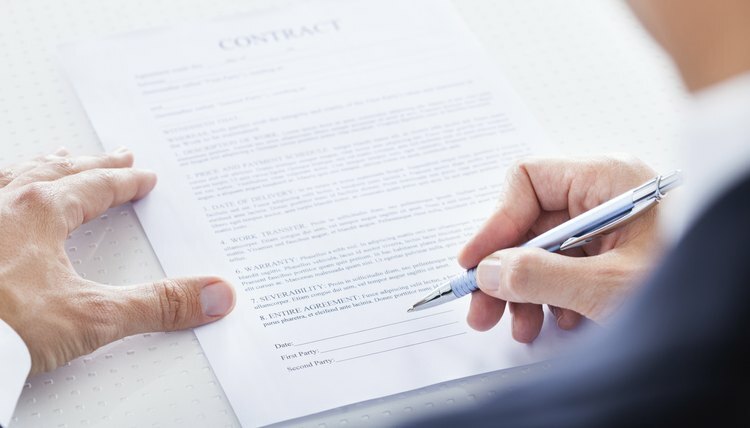 Most people rely on lawyers to mitigate the risks associated with a legal contract, which includes making sure you sign the agreement correctly. Not everyone can afford legal backup, however. If you're writing a contract on your own, you must make sure it is signed properly, otherwise you might not be able to enforce the contract. A legal signature can be handwritten, faxed or electronic as long as the person signing the document is authorized by the company or partnership. The traditional way of signing a legal agreement is to print out the document and sign it with your usual signature. This is straightforward if you are signing the agreement as an individual or a sole proprietor. If you run your business as a partnership, then the general partner should sign on behalf of the partnership. The signature block at the bottom of the agreement should state the partnership's name, the name of the person signing and his or her designation as general partner. When a corporation enters into a contract, the document must be signed by someone who has the authority to enter into legal obligations on behalf of the corporation. Otherwise, the corporation may not be bound by the contract. The corporation's chief executive officer or president is presumed to have the proper authority. In the signature block, include the name of the corporation, the name of the person signing on the corporation's behalf and the person's title. The owners of limited liability companies are known as members. Members can run the LLC themselves or hire managers to run the company on their behalf. Either a member or a manager can legally sign agreements on behalf of an LLC. The signature block should state the name of the LLC, the name of the person signing on the LLC's behalf, and his or her designation as a member or manager. If you're signing by hand, then it is acceptable to write your usual signature in a stylized fashion or to use any mark that represents you, such as your initials or even an "X." As long as you have the intention to sign, then your mark is considered a legal signature. You can make your mark by pen, pencil or any other media, but take care to choose ink that doesn't fade over time. Electronic signatures are perfectly legal in the United States and carry the same weight as paper contracts signed in ink. Per the Electronic Signatures in Global and International Commerce Act, you can "sign" electronic contracts in various ways. For example, you could email a contract to a business associate who then emails it back with her name typed into the signature area, or you could use digital signing software that uses cryptographic scrambling to create an electronically signed PDF document. Certain documents can't be signed electronically. These include wills, adoption and divorce papers, court documents and eviction notices. Faxed signatures are falling out of favor in the era of e-signing. Nonetheless, a faxed signature remains legal and binding as long as both parties accept that the signature is genuine. When problems arise, it is usually because one party claims that a signature was forged. It is wise to follow up the fax with a paper copy of the agreement bearing the original signature by mail. If you're not available for signing a legal document – for example, you're out of the country for an extended period – then you can appoint a third party to sign for you. This generally means giving explicit permission for someone, called an agent, to sign on your behalf. For businesses, it's possible to give an employee the authority to sign on behalf of the whole company. FindLaw: What Are the Rules Regarding Signatures in Contracts? Thompson, Jayne. "What Is Considered a Legal Signature?" , https://legalbeagle.com/4966268-what-considered-legal-signature.html. 04 November 2018.